The option of opening car windows using a power regulator has long become familiar to modern car owners. However, it wasn’t always like that. Let’s try to figure out what a car window regulator is and how to handle it so that there will be no problems. In 2018, the window regulator turned 90. After all, the very first window regulators were installed on cars produced by the German automaker Brose, back in 1928. Two years earlier, the concern’s specialists had got a patent for the invention of a manual window lifter. Automatic window regulators appeared only in 1940 in the US. It was the Packard-180 model from the currently non-existent manufacturer Packard. The work of these devices was based on the use of an electrohydraulic system, and the device itself was significantly bigger than the modern one. Further, the Ford concern began to use power window regulators in their cars. Lincoln cars, sedans and limousines, as well as Cadillac models, began to be equipped with the window regulator system since 1941. When transformable convertibles were designed, the question about the simultaneous operation of window lifters and roof folding systems arose. An option with the use of a vacuum drive was proposed, which was later supplemented with a hydraulic pump. Finally, in 1956, an electrically operated window lifting system was introduced. The latter was install on the Continental Mark II as a result of the joint work of Brose and Ford Motor Co. Thus, manual lifters began to be gradually replaced by an electric drive, and today they dominate, since almost all cars are equipped with power window regulators. A window regulator is a device allowing to roll side car windows up and down. There are various types of these mechanisms. They differ in both design and operation. Therefore, it is necessary to familiarize yourselves with the window lifter mechanism in more detail. Depending on the drive type, as already mentioned above, there are manual and power window regulators. Manual ones operate with the help of a special handle on a door card, which looks like a paddle. With efforts of a hand, the window moves in the right direction. An electric motor replaces the efforts of a hand in the electric lift. To roll the window up and down, simply press the corresponding button. Further, the electronics will do everything itself – the signal will be transmitted to the reversing motor, and the latter will begin to move on the rail. Usually such a switch is located near the door handle. 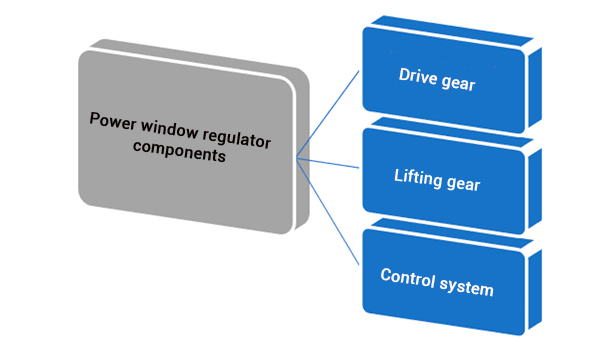 Depending on the configuration of a car, there are two or four window regulators in it. Drive gear (or geared motor) in its operation combines an electric motor, toothed and worm gears, that are made in the form of a single unit. This mechanism is necessary to create a force that will raise and lower the window. Due to the use of a worm gear, the window can’t be opened accidentally. The worm gear is designed so that the rotation transmission will be only in one direction – from the worm to the wheel. If there is an attempt to make rotation in the opposite direction, the transmission will be blocked. By means of a lifting mechanism, the window is directly raised and lowered. The design of the mechanism can be very different, hence there is a gradation of window regulators. They can be rack and pinion, cable and lever. Cable and lever lifting mechanisms are the most popular among manufacturers. The cable window regulator is a flexible element (chain, cable, toothed belt) that is tensioned inside the door between several rollers. The flexible element is powered by an impulse coming from the drive drum. When the drum rotates, one branch of the flexible element winds up, the second branch winds off. The element itself begins to move progressively. The flexible element is connected to the window with a plate. The main advantage that distinguishes the cable regulator is its high maintainability. Regulators can also have one or two levers. The single-lever window lifter mechanism in its design has a lever, a toothed gear and plates. Plates are fastened to the window with bolts and move it in the right direction. There is a window runner at the end of the lever – it is a device that moves the plate along the rack with the window. It is usually a plastic roller with a small amount of lubricant. A working principle of such a front window lifter mechanism is very simple. When the driver presses the button or turns the crank, the toothed gear is activated. It moves along the rack up and down. And since the window is connected to the plate, it also moves in a given direction due to the runner. If it’s an power window lifter mechanism, this process is controlled by an electric motor. It is one that moves the gear in the direction given by the button. There are no cables here – only wires. It is believed that the single-lever mechanism is less reliable (skew occurs more often), fails faster, and the process of window lowering is slower. The double-lever window lifter mechanism has, accordingly, not one, but a pair of levers, as well as classic plates and toothed gears. A cable or reversing motor is used as a drive element. Runners are attached to the second lever in two places. One moves the plate with the window, the second moves only on the plate inside the door. Toothed gears are located on left and right sides of the drive gear. A rack and pinion lifting mechanism includes a stationary toothed rack and a guide plate, which is connected to the window. The drive mechanism is located on the plate, and its gear is engaged with the toothed rack, due to which the window moves. The window moves in a given direction due to the guides: there are grooves inside door frames, and there are special rails in the body. 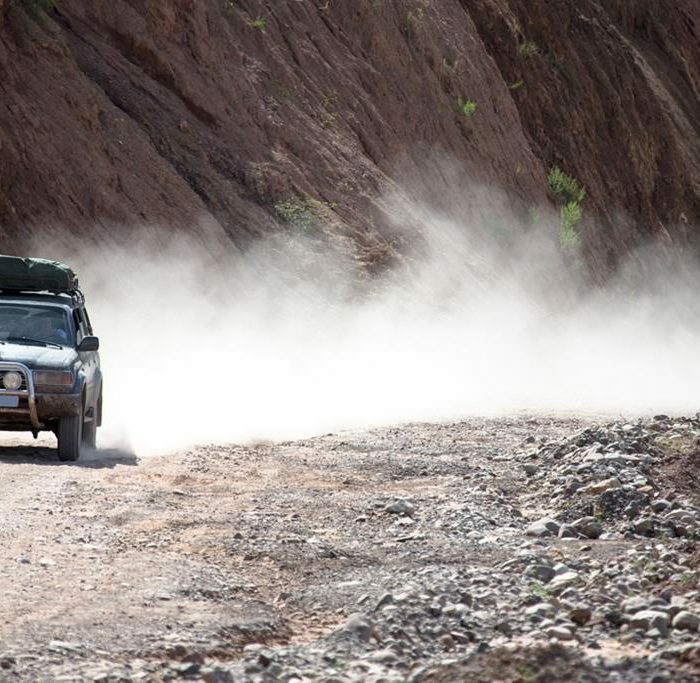 Rack and pinion windows are more durable (if the gears are not plastic), have a higher speed than cable ones, and at the same time produce less noise. Control of power window regulators can be direct or electronic. With the direct control, the window regulator is controlled by a three-position switch connected to the power supply circuit of the electric motor. When the switch moves to the first position, the motor rotates in one direction, and when the switch is in the second position, the motor changes polarity, that is, the direction in which the runner rotates is changed. 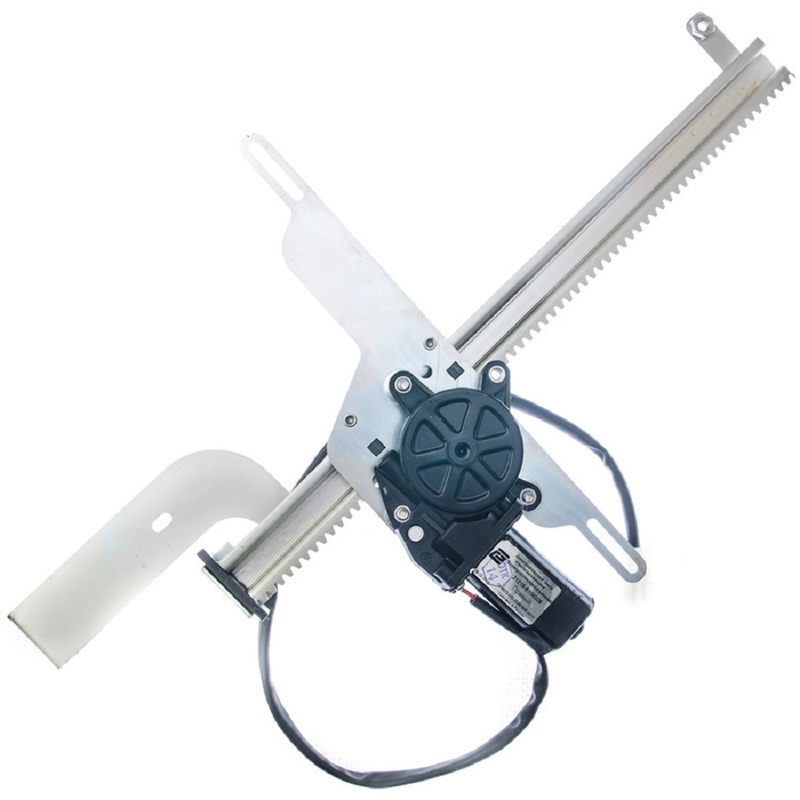 Since such a window regulator is quite injurious, it is used in a rather limited quantity. The electronic control window regulator has more complex design, which includes input devices, an actuator and electronic control unit. Input devices are mode switch and window position sensors. The design of the electronic control unit includes three-position switches. On the driver’s side, there is a switch block in the door through which the window regulator can be operated on each of the doors. In the same place, there may be a door window lifter’s interlock switch. There can be Hall devices as window position sensors. They are mounted on a worm wheel. When the worm wheel rotates, the magnetic flux changes, and this change is converted by sensors into voltage pulses coming out of the sensor. 3) when the direction of motion is set, a pulse shift from a pair of sensors is taken into account. Each window regulator often has its own electronic control unit. In this control unit, signals from incoming devices are converted into control impulses for an actuator – a direct current electric motor. There is a connection between all units through the central control unit. There are two types of power window regulators: pulse and non-pulse. Pulse regulators can work both in impulse and normal mode. Normal mode means that the power regulator works only when the control key is pressed. In impulse mode, one short press is enough to completely lower or raise the window. Pulse window regulators are equipped with five-position control buttons, which have two positions up and two down from the neutral one. When you move the button to the first position, the window lifter works as usual, and the window will lower or rise exactly as much as the driver wants to lift it. In the second position, a control impulse is given to open or close the window completely. 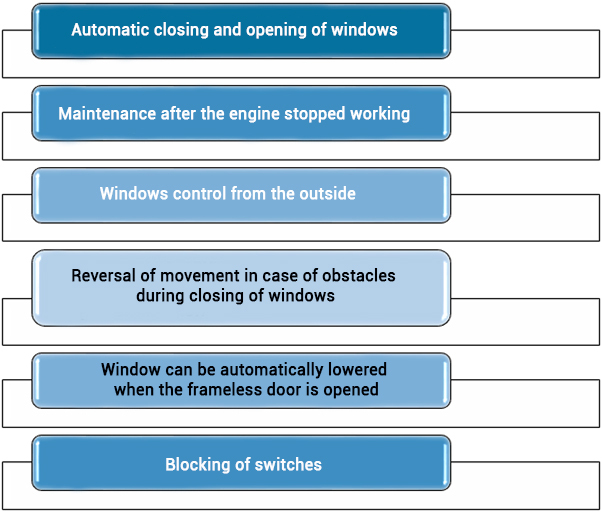 That is, ensuring automatic closing and opening of a window depends on how long the switch is pressed. If the pressing is short-term, the window will be raised or lowered, and if the button is pressed for a long time, the window will close or open automatically. And, you can install power cinches, that automatically close all windows when the car is put on the alarm. 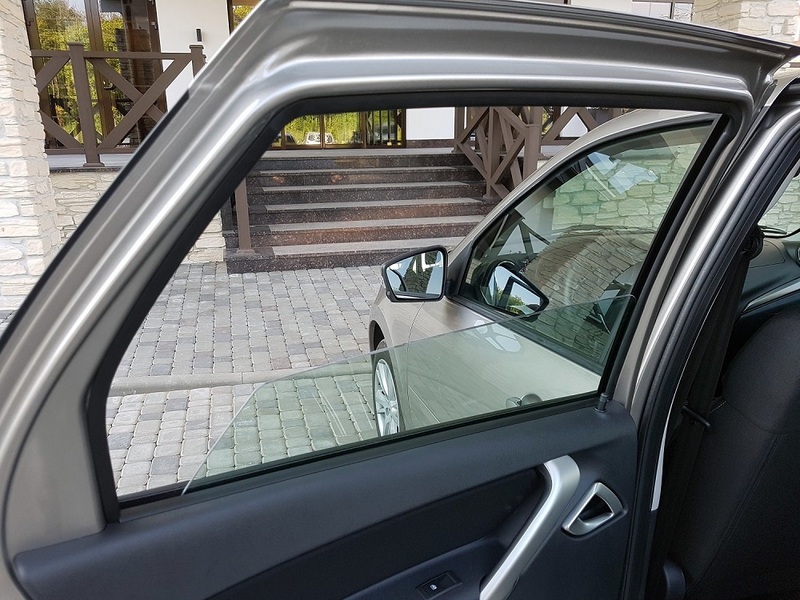 Window regulators were originally designed so that the driver and passengers could roll car windows up and down themselves. But the driver also needs a driver’s license. It’s better if the latter is international. It can be processed on our website. 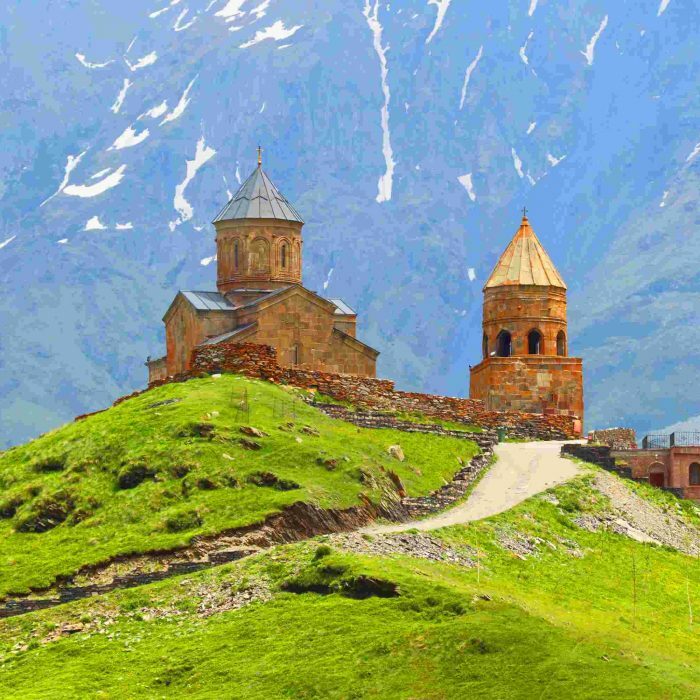 Hurry up to become the owner of an international driver’s license – this is a guarantee of trouble-free driving abroad in most countries of the world!